Transportation of EVMs in vehicles will be monitored through GPS during the four-phase Lok Sabha elections in Madhya Pradesh. 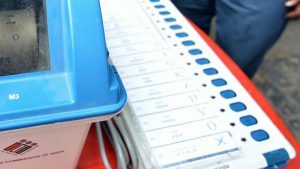 In a first for the state, transportation of EVMs in vehicles will be monitored through GPS during the four-phase Lok Sabha elections in Madhya Pradesh, a top poll officer said Monday. Polling for all the 29 Lok Sabha seats in the central Indian state will be held during April 29 and May 19. “GPS (Global Positioning System) would be fitted in vehicles transporting EVMs during the entire elections process for the first time in Madhya Pradesh. Each district will have around 300-400 GPS monitored vehicles,” state Chief Electoral Officer VL Kanta Rao told reporters. Madhya Pradesh consists of 51 districts. The GPS-fitted vehicles would be tracked through the control rooms that would be set up at various district headquarters, Rao said. Meanwhile, the CEO said that unaccounted cash, illicit liquor and other items worth Rs 7,60,84,472 have been seized by various departments since the poll code came into effect on March 10 till March 21. “The seized items include illicit liquor worth Rs 2,79,94,424, contrabands worth Rs 14,07,800 and unaccounted cash worth Rs 3,10,69,522,” Rao added.